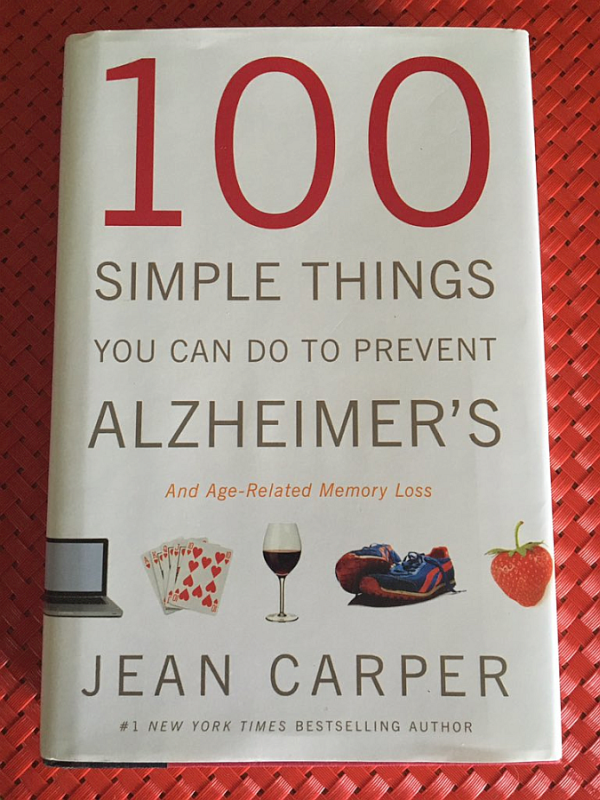 100 Simple Things You Can Do To Prevent Alzheimer’s And Age-Related Memory Loss by Jean Carper is one of my favorite books in my entire personal library. It’s also one that I reopen again and again. The information the author shares is fascinating as well as vital. What’s more, it’s also exciting because there are things we can do (and avoid doing) to increase our odds of avoiding Alzheimer’s, Dementia, and other forms of memory loss. It’s like being in a room with the scariest zombie you ever saw and suddenly seeing an escape hatch. After best-selling author Jean Carper discovered that she had the major susceptibility gene for Alzheimer’s, she was determined to find all the latest scientific evidence on how to escape it. She discovered 100 surprisingly simple scientifically tested ways to radically cut the odds of Alzheimer’s, memory decline, and other forms of dementia. Did you know that vitamin B 12 helps keep your brain from shrinking? Apple juice mimics a common Alzheimer’s drug? Surfing the internet strengthens aging brain cells? Exercise is like Miracle-Gro for your brain? Each of the 100 “simple things” include 2-4 pages of information to back it up. There are quotes from leading experts, research data, and fruits of research the author (a medical journalist) has conducted over the years. The 100 tips are easy to implement in your daily life and, here’s a wonderful bonus – whatever benefits your brain benefits your heart. Follow these wonderful steps and they’ll lead you to a healthier brain and heart…. now that’s someplace worth going! I want very much for you to grab your own copy of this book, so I don’t want to give much away. 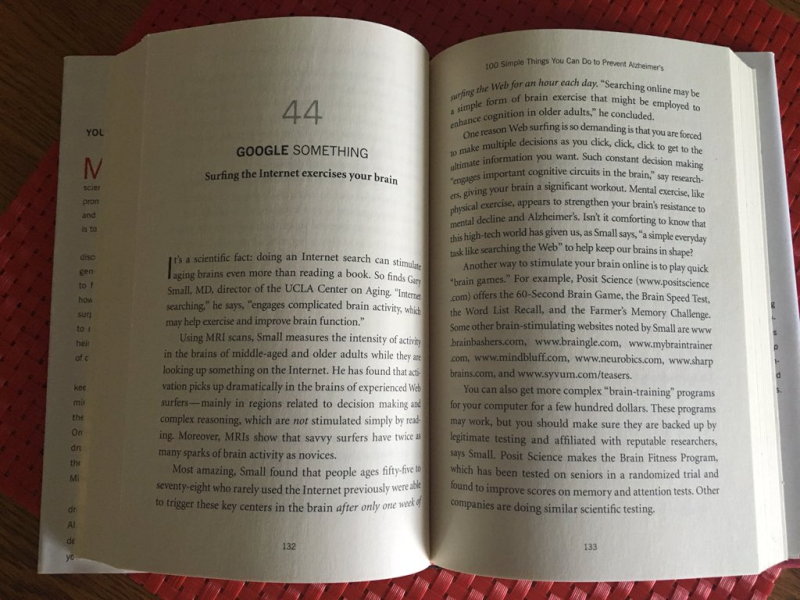 However, I will share one of the tips with you: #44 Google Something! Surfing the internet actually exercises your brain. 100 Simple Things You Can Do to Prevent Alzheimer’sWho is This Book For? You may automatically associate this book with readers who are over 50 and, while we Baby Boomers can benefit greatly from it, let’s not leave out the youngin’s! I wish I had had access to this information when I was in my 20’s, I could have made smarter decisions then that would help protect me now. Make no mistake about it, this book is for anyone in any age group. Basically, anyone who values their brain enough to protect it will love this book. The information could prove to be the weapons you need to save you from that scary zombie – the one no one wants to talk about, but everyone thinks about: Alzheimer’s Disease. See 100 Simple Things You Can Do to Prevent Alzheimer’s for more information. This one qualifies as a MUST HAVE. This is an incredible review. Thanks so much for this!